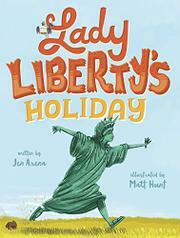 When the Statue of Liberty decides to leave her pedestal and travel around the country, her absence may result in the cancellation of the Fourth of July. America’s symbol for freedom has stood still for over 100 years and is feeling the strain: “My neck is stiff. My arms are aching. I’ve had a cramp in my leg for a decade at least.” Moreover, she’s tired of the unchanging view. On a whim and with some encouragement from pigeon friend Moe, Lady Liberty leaves her tablet and torch behind to visit many of America’s landmarks, keeping Moe posted on her travels with postcards. Like a green, robed Paul Bunyan looming large across the page, the smiling statue travels America, from the sandy shores of New Jersey and Cape Cod, then west to St. Louis’ Gateway Arch and wheat fields in Kansas, and on to the Rocky Mountains and Golden Gate Bridge. Children are given a view of each stop with expansive scenes that maximize the absurdity of the situation (as when she photo-bombs Mount Rushmore). New Yorkers and tourists are greatly relieved when Lady Liberty returns from the Florida Keys just in time for the Fourth of July. A postscript provides historical information on the statue’s creation and installation, but it’s too bad there is no final quick review of each of the landmarks presented.